What happens when you combine Winterlude with Canada 150 celebrations? You get a winter playground full of interactive fun for the whole family! 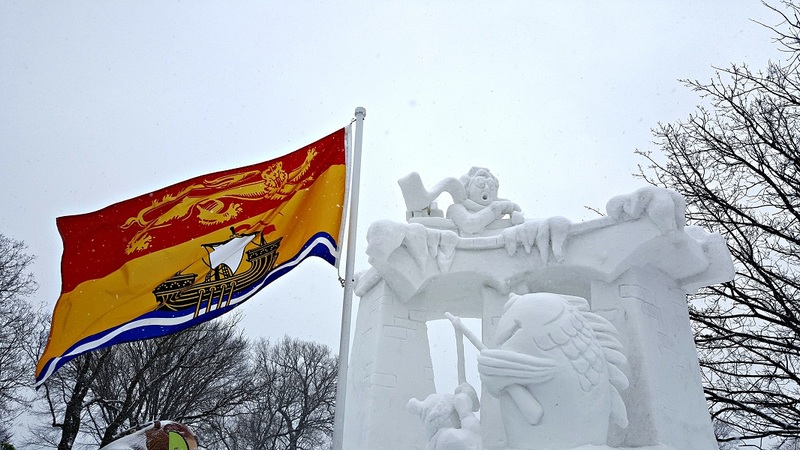 Until February 20th, Winterlude’s Snowflake Kingdom is the place for family fun in the Outaouais! We have thoroughly enjoyed experiencing Winterlude on several occasions over the years, and our visit this year was no exception! Thinking of visiting this world-famous winter festival? Here are 8 tips to make your Canada 150 Winterlude experience at Snowflake Kingdom a huge success! Make sure you don’t miss anything. Check the Winterlude Schedule before you arrive to help you plan your time at Snowflake Kingdom. Sadly, we missed the Ice Hog Family & the Extreme Aerial Acrobatic and Trampo-wall Show. Be sure to wander around the entire grounds of Snowflake Kingdom and keep your eyes peeled. When it’s busy, it’s easy to walk right by some displays. We almost missed the seeing the Aboriginal Village (a great learning experience, especially for kids). 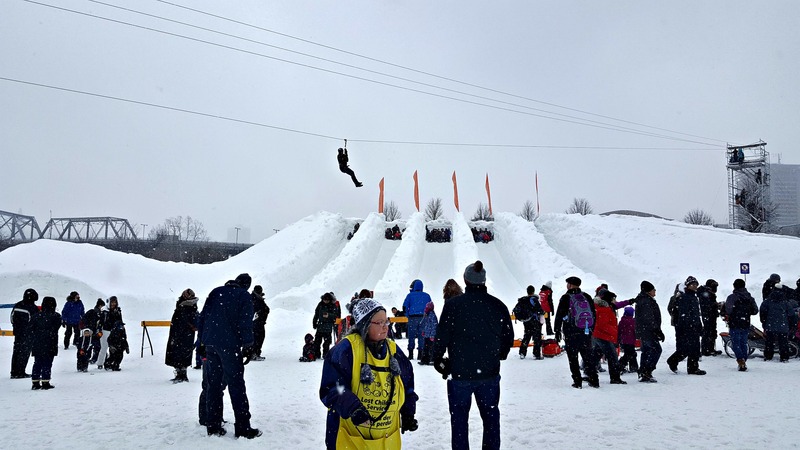 Looking to experience the fun of dog sledding, or ziplining 30 feet in the air overlooking the gorgeous Ottawa skyline? Don’t miss out! Visit the dog sledding and Zipline early in the day to avoid the longer afternoon line ups at these popular experiences! Bonus: the Zipline is FREE for all visitors in 2017! Don’t let the weather stop you from visiting! After all, this is winter and it’s Canada! The day we visited, it was snowing quite hard at times. The snow just enhanced our visit and made this winter playground even more beautiful! Bring your mobile phone or camera. There are plenty of photo ops at Snowflake Kingdom with the Ice Hog Family, the snow sculptures, the Canada 150 Canadians, and more! Bring some cash. Dog sledding passes are $10/adult and $5/child. You will also crave some tasty local treats like BeaverTails, poutine, and of course, some maple taffy! Snowflake Kingdom is conveniently located in Gatineau, in Jacques-Cartier Park, just across the bridge from downtown Ottawa. You will find parking on neighbourhood streets north of the park. We saw some local residents charging $10 to park in their driveways or small parking lots, however, we had no trouble locating free parking on a street that was just 2 blocks from Snowflake Kingdom. Our best advice? Play! Release your inner kid and enjoy all the experiences with your little ones! Don your snow pants and whiz down those giant ice slides! They are great fun for all kids – even us big kids! For more information about Winterlude and Snowflake Kingdom, be sure to visit the Outaouais Tourism website! Sandy is a travel writer, Social Media Director for the BConnected Conference, and blogger at Canadian Blog House. She has called Ottawa home for the last 6 years and loves to take the short drive across the bridge to experience all the great things the Outaouais region has to offer!